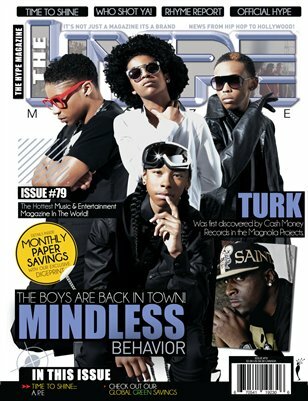 The Hype Magazine celebrates its 11th year with the announcement that it will soon debut on newsstands nationally. INDIANAPOLIS - June 11, 2013 - PRLog -- America’s number 1 digital magazine and online entertainment portal, The Hype Magazine (http://TheHypeMagazine.com) is celebrating their 11th year with the announcement that the outlet is heading to newsstands in November 2013. The Hype Magazine will hold their official national launch event during the All Star Fashion & Music Industry Weekend, hosted by John Blassingame, Publisher of Hype Hair, TBW Style Report & New Day Associates, along with The National R & B Music Society Inc. official music competition on November 30th, at the Liberty International Marriott, Newark, NJ. The magazine will hold its official 11-year anniversary event in Muncie, IN September 7th, 2013. The Hype Magazine, which publishes print and online issues, will use the events to begin a new era for the outlet. For the last several years, the magazine has published limited edition print issues quarterly, and monthly in the online format. Growth of online subscribers and increased select retail circulation spurred the return to monthly print editions. The outlet will also maintain its exclusive web portal which is updated daily. Mr. Blassingame is about opportunity to young entrepreneurs. He believes in giving back to our young African American youth and he's giving back to them as a publisher, news consultant and as a producer of major fashion events for the last 34 years. Established in 2002, The HYPE Magazine is headquartered in Indianapolis, Indiana. HYPE stands for "How You Perceive Everything." It is designed to provide its patrons with relevant entertainment, music news, eye-catching consumer ads, and music reviews of their favorite established entertainers, while spotlighting independent artists seeking to gain greater exposure. This magazine reaches a unique group of consumers who view The HYPE Magazine as their source for music, new trends, new products, services, entertainment, events and topics relevant to their daily lives; both personal and professional. The HYPE Magazine’s mission is to tap into new technologies and digital media innovations to support the continued growth of the brand. NEW DAY ASSOCIATES is a distribution-consulting firm established for the purpose of attaining national and international distribution for fresh new, or regional titles looking to expand their coverage. There are many different types of titles on the market today. Out of the many distribution companies that exist, a publisher will need to choose the one which best suites their target market. NEW DAY ASSOCIATES can help you obtain the best national/international distributor that specializes in attaining that goal for your title! This company has played a key part in the launching of many successful titles such as, WORD UP! Magazine, Russell Simmons' ONE WORLD, TRACE from London, Bernard Bronner's UPSCALE, TAE KWON DO TIMES, BASEBALL AMERICA, HYPE HAIR, TODAY'S BLACK WOMAN, BLACK MEN and many more.